Sleep is an essential part of staying healthy, yet many teens don’t get enough sleep. The C.S. Mott Children’s Hospital National Poll on Children’s Health asked a national sample of parents about how often their teens age 13-18 experience sleep problems and what they do to address it. 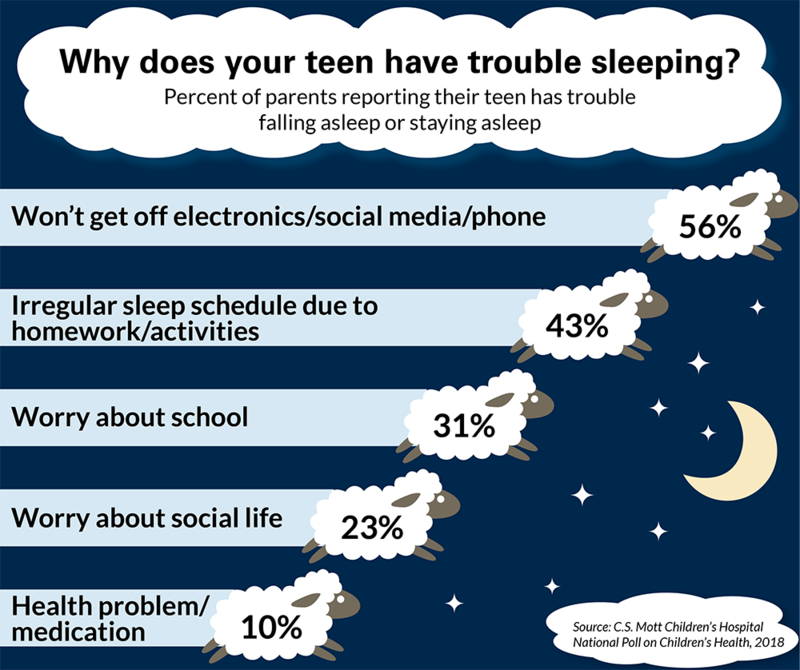 Overall, 43% of parents reported that their teen has trouble falling asleep or has trouble waking up and being unable to get back asleep: this included 25% with occasional problems (1-2 nights per week) and 18% with frequent problems (3 or more nights per week). Parents believed the cause of sleep problems was that their teen won’t get off electronics, social media and cell phones (56%), irregular sleep schedules due to the teen’s homework or activities (43%), worry about school (31%), and worry about social life (23%). Ten percent of parents said their teen had sleep problems related to a health condition or medication; this reason was cited more often for teens with frequent vs. occasional sleep problems. Parents had their teens try a range of strategies to deal with sleep problems, including limiting caffeine in the evening (54%), turning off electronics/cell phones at bedtime (53%), having a snack before bed (44%), and natural/herbal remedies such as melatonin (36%). One quarter of parents (28%) said their teen had tried some type of medication to address sleep problems, including over-the-counter sleep medicine (16%), over-the-counter antihistamines (14%), and prescription sleep medicine (5%). Forty percent of parents of teens with frequent sleep problems, and 22% with occasional sleep problems, said they and/or their teen have talked with a doctor about how to address sleep problems. Common doctor’s recommendations included turning off electronics/cell phones (72%), having teen adhere to a regular sleep schedule with a set bedtime (64%), limiting caffeine (47%), and taking natural/herbal remedies (42%). Parents recalled that doctors recommended prescription sleep medication (17%) more often than over-the-counter sleep medicine (7%) or over-the-counter antihistamines (5%). Among all parents of teens, there was a range of beliefs about the safety of using sleep aids at this age. Most had positive views about natural/herbal sleep remedies for teens (60% safe, 23% unsafe, 17% unsure). Parents were less positive about over-the-counter sleep medicine (23% safe, 57% unsafe, 20% not sure) and antihistamines (35% safe, 47% unsafe, 18% not sure). Parents were most hesitant about the safety of prescription sleep medicine for teens (6% safe, 72% unsafe, 22% not sure). 1 in 6 parents say their teen experiences frequent sleep problems, having trouble falling asleep or staying asleep 3 or more nights per week. Among parents of teens with frequent sleep problems, only 40% say they or their teen have talked with a health care provider about how to address sleep problems. Parents believe that over-the-counter sleep medicine is safer for teens than prescription sleep medicine. This Mott Poll report demonstrates that sleep problems are common among teens: 43% of parents report that their teen has trouble falling asleep or staying asleep through the night. Inadequate or disrupted sleep can cause teens to feel irritable or moody; it can cause difficulty concentrating in school and increase the risk of auto accidents for teen drivers. Inadequate sleep has been linked to health problems ranging from obesity to depression. It can be challenging for parents to determine the extent of their teen’s sleep problems, as teens may not discuss their inability to fall asleep, or mention the number of nights they wake and are unable to go back to sleep. Parents also may be uninformed about the causes of their teen’s sleep problems. Using electronics and social media into the night are noticed most frequently by parents, and are thought to be likely contributors to sleep problems. Still, parents shouldn’t overlook the possibility of other causes, including anxiety about school, peer relationships, or the future. In this Mott Poll, only about one quarter of parents of teens with sleep problems indicated they or their teen had talked with a doctor about the causes or possible remedies for sleep problems. This is a missed opportunity for parents and teens to get support and guidance. An appropriate place to start is the teen’s primary care provider; in more complex situations, teens may be referred to a sleep specialist. When families did consult a doctor, the advice included some strategies parents are using, including turning off cell phones and electronics, as well as limiting caffeine. Nearly two thirds of doctors recommended establishing a regular sleep schedule for the teen; this is part of what is termed “sleep hygiene” and has been shown to be effective in reducing sleep problems. Sleep problems among teens can occur due to pain or discomfort from an injury or other health condition, or as a side effect of medication. Parents of teens with frequent sleep problems (3 or more nights per week) were three times as likely to cite health-related causes, compared to parents whose teens had occasional sleep problems. This suggests that parents of teens who have chronic medical conditions, as well as those with acute injuries, should talk with a health care provider or pharmacist about strategies to prevent health-related sleep problems. Use of natural/herbal remedies was reported by 1 in 3 parents of teens with sleep problems, and also was commonly recommended by providers. Natural remedies range from supplements like melatonin to herbal teas. Some studies have shown that natural remedies may help teens fall asleep, while others have not shown them to be effective. Parents and teens may decide to try melatonin or other natural remedies to see if they can reduce the teen’s sleep problems. This Mott Poll shows that many teens are using over-the-counter medicines to address sleep issues. Among parents of teens with occasional or frequent sleep problems, about 1 in 6 said their teen has used over-the-counter sleep medicine, such as NyQuilTM or a “PM” formulation of pain reliever or cold medicine; nearly that many said their teen has tried an over-the-counter antihistamine, such as Benadryl®, to help with sleep problems. Yet the majority of parents are unsure if these over-the-counter medicines are safe for teens to use in addressing sleep problems. Parents seem even more hesitant to have their teen take prescription sleep medication, such as Ambien® or RestorilTM; 72% of parents believe prescription sleep medication is unsafe for teens. However, parents reported that doctors recommended prescription sleep medication more often than over-the-counter medications. Parents and teens with sleep problems should talk with a health care provider about whether and when prescription sleep medication can be helpful, how it can be used safely, and why it may be preferable to over-the-counter medicines. What's keeping your teens up at night? Why don't teenagers get enough sleep? This report presents findings from a nationally representative household survey conducted exclusively by GfK Custom Research, LLC (GfK), for C.S. Mott Children’s Hospital. The survey was administered in April 2018 to a randomly selected, stratified group of parents age 18 and older (n=2,074). Adults were selected from GfK’s web-enabled KnowledgePanel® that closely resembles the U.S. population. The sample was subsequently weighted to reflect population figures from the Census Bureau. The survey completion rate was 61% among panel members contacted to participate. This report is based on responses from 1,018 parents who had at least one child 13-18 years. The margin of error is ±2 to 6 percentage points and higher among subgroups. Clark SJ, Singer DC, Schultz SL, Gebremariam A, Freed GL. When teens can't sleep. C.S. Mott Children's Hospital National Poll on Children's Health, University of Michigan. Vol 32, Issue 4, September 2018. Available at: https://mottpoll.org/reports/when-teens-cant-sleep.